Hope we get to see the sun again some day. It has been overcast for almost two weeks now… anyway, it certainly feels that way. Otherwise though, the weather has not been too bad. Temperatures in the 40s and light winds. Pretty good for December. Tomorrow looks like 50 but a chance for showers early in the day. Christmas day looks like mid 50s and sunshine!? Great Christmas present. 40s but dry for next weekend. Pattern this past week was two to three units on each morning from :00-10:00 then off for six to seven hours. No generation at all this weekend. Monday’s projection looks like a repeat of this past week. Good day yesterday for Bob and Ann from Arkansas. They spent the warmest part of the day on the water with Stan. It was a copper head black midge and peach egg day. Carolyn got to go fishing and put a smile on her face with the second cast of an olive filoplume on the 2.6 ips sinking leader. Nice, fat rainbow. Fish on everything she threw, mini sculpin, dark red crackleback, tiger tail (best) and olive JQ streamer. Wonderful couple hours in the water! Whoa! What did you put in that milk?! 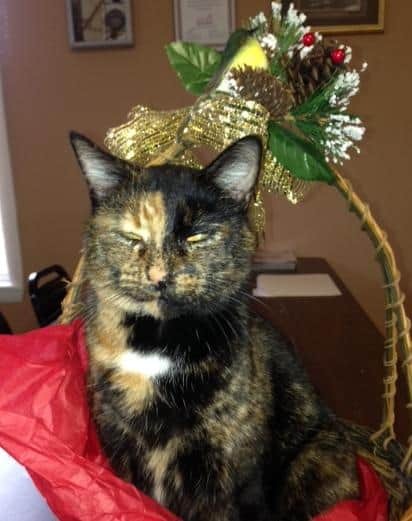 Caddis wants to wish everyone a Very Merry Christmas and a Happy and Safe New Year! All of us here at River Run Outfitters would like to chime in with her on that wish. Thanks to everyone for your support and friendship this past year. May your 2015 be full of as many days as you want standing in the water chasing those beautiful trout! 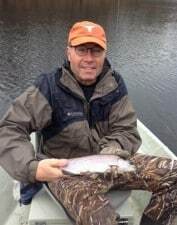 This entry was posted on Sunday, December 21st, 2014 at 2:54 pm	and is filed under Fishing Reports. You can follow any responses to this entry through the RSS 2.0 feed. You can leave a response, or trackback from your own site.